A couple of days ago I wrote about the new paper by Steven Sherwood and Nidhi Nishant, which was reporting the release of an updated radiosonde dataset, and findings from an analysis of those data. One of the things the authors reported was the "tropospheric hot spot" - though they didn't use that term in the paper itself (only the press release). I've never previously thoroughly looked into this myself. I knew about it in general terms, because some deniers point to what they regard as lack of evidence as evidence that global warming isn't happening. Which is really, really weird when you think about it. 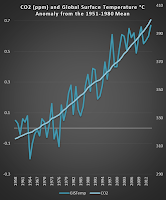 Or when you look at surface temperature data as in the chart on the right. Anyway, I decided to go and learn more about this so-called "tropospheric hot spot". What the diagram above shows is the temperature trend at different levels in the troposphere, going from south to north (left to right) above the earth. The red colour is the greatest trend. You can see the blobs that show fastest warming at height, between around 30 south and 20 north. The y axis is pressure. Pressure drops with altitude. The blobs are evident from around 500 hPa upwards to near the interface between the troposphere and the stratosphere. Lapse rate. This is the rate of decrease of temperature with increasing height above the surface. Adiabatic. This refers to a process in which there is no heat gained or lost. Moist adiabatic lapse rate (MALR). The dry adiabatic lapse rate is the rate of decrease of temperature in dry air, and the moist, as you can guess, is that in moist air. That is, the rate of decrease in temperature with altitude, of a parcel of air, as it rises in the atmosphere under adiabatic conditions. The moist adiabatic lapse rate has to be less than the dry adiabatic lapse rate. This is because as water vapour rises it gets colder and condenses into water (or freezes into ice) . This condensation releases latent heat - the air at that height gets warmer than it would if there was no condensation (or freezing). Tropical lapse rate. This is the lapse rate in the atmosphere above the tropics. Based on theoretical considerations and simulations with General Circulation Models (GCMs), it is expected that any warming at the surface will be amplified in the upper troposphere. The reason for this is quite simple. More warming at the surface means more evaporation and more convection. Higher in the troposphere the (extra) water vapour condenses and heat is released. Calculations with GCMs show that the lower troposphere warms about 1.2 times faster than the surface. For the tropics, where most of the moist is, the amplification is larger, about 1.4. In the deep tropics, in the troposphere, the lapse rate (the rate of decrease of temperature with increasing height above the surface) is largely controlled by the moist adiabatic lapse rate (MALR). This is true both in complicated simulations performed by General Circulation Models, and in simple, back of the envelope calculations (Santer et al, 2005). The reasoning behind this is simple. If the lapse rate were larger than MALR, then the atmosphere would be unstable to convection. Convection (a thunderstorm) would then occur, and heat the upper troposphere via the release of latent heat as water vapor condenses into clouds, and cool the surface via evaporation and the presence of cold rain/hail. If the lapse rate were smaller than MALR, then convection would be suppressed, allowing the surface to heat up without triggering a convective event. On average, these processes cause the lapse rate to be very close to the MALR. Note that this argument does not apply outside the tropics, because the dynamics become more complex due to the Coriolis force and the presence of large north/south temperature gradients, or in regions with very low relative humidity, such as deserts, where the atmosphere may be far from saturated near the surface and thus the MALR does not apply. Because the MALR decreases with temperature, this means [that] any temperature increase at the surface becomes even larger high in the troposphere. This causes the so called hot spot, a region high in the troposphere that shows more warming (or cooling) than the surface. Note that at this point, I haven’t said a thing about greenhouse gases. In fact, this effect has nothing to do with the source of the warming, as long as it arises near the surface. Surface warming due to any cause would show a tropospheric hotspot in the absence of other changes to the heating and cooling of the atmosphere. Never the less, the tropospheric hotspot is often presented as some sort of lynchpin of global warming theory. It is not. It is just a feature of a close-to-unstable moist atmosphere. The troposphere—that part of the atmosphere that is involved in weather, about 85% by mass—is expected to warm at roughly the same rate as the surface. In the tropics, simple thermodynamics (as covered in many undergraduate meteorology courses) dictates that it should actually warm faster, up to about 1.8 times faster by the time you get to 12 km or so; at higher latitudes this ratio is affected by other factors and decreases, but does not fall very far below 1. 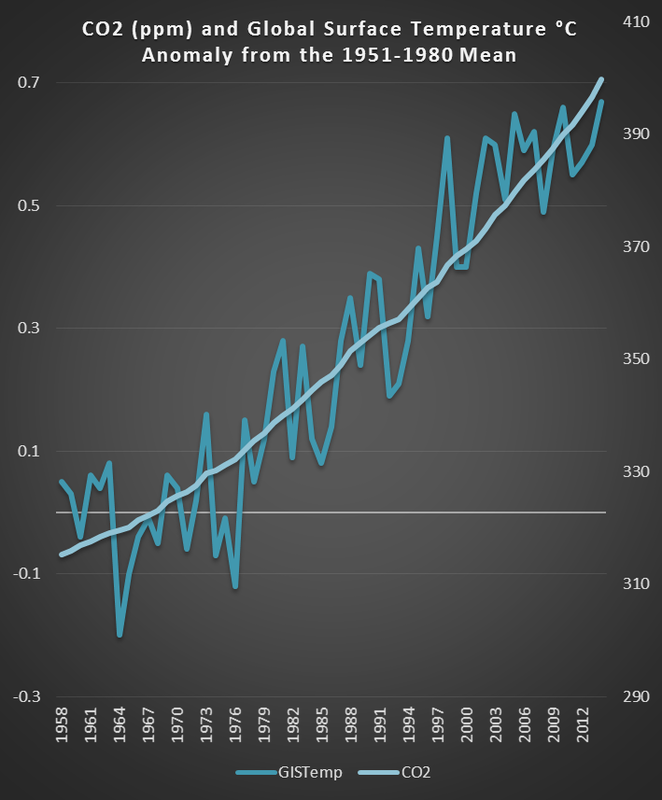 These theoretical expectations are echoed by all numerical climate models regardless of whether the surface temperature changes as part of a natural fluctuation, increased solar heating, or increased opacity of greenhouse gases. To reiterate, when people talk about the "tropospheric hot spot" they are referring to a region of the troposphere above the tropics, not the air over the mid-latitudes or the poles. And to it warming at a faster rate than warming at the surface. Satellites are subject to drift. At the time (and maybe even today - does anyone know? ), satellites are adjusted every week to match radiosondes. Radiosondes weren't designed to detect small climate changes. Changes in software, and bug fixes in software. There have been a number of papers looking at this subject since the paper by Steve Sherwood et al in 2005. Some argued there was no increase in tropical lapse rate, and some argued there was. In around 2008, Robert Allen, a student of Steve Sherwood, measured the effect by looking not at temperature data from radiosondes, but by analysing wind data from radiosondes. 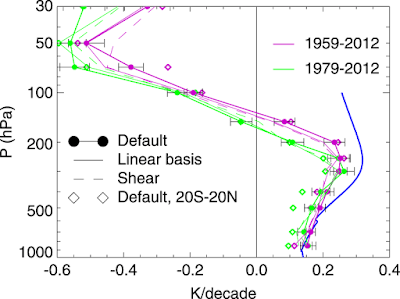 He found "Warming patterns [that] are consistent with model predictions except for small discrepancies close to the tropopause." The recent paper was based on an analysis of a revised radiosonde data set, and also found warming broadly consistent with expectations. This is shown in the diagram up top and in Figure 2 from the paper. There was another paper published recently, by Stephen Po-Chedley, Tyler J. Thorsen, and Qiang Fu, which I almost forgot to mention. They looked at satellite data for the middle troposphere (not the lower troposphere, which is often compared to surface temperature). They found that, when corrected for diurnal drift, these data also showed that the tropospheric warming over the tropics was consistent with that expected. If the world were cooling instead of warming, my understanding is that this too would be magnified in the tropical troposphere. That is, instead of a "hot spot" there would be a "cold spot". The air higher up in the troposphere above the tropics would cool more quickly than the surface. The surface would be cooling, less water would be evaporating, the air as a whole would be cooler, so water would condense (releasing latent heat) at an ever lower altitude in the troposphere above the tropics. Therefore the air higher up would cool more quickly. "What's the punchline? Well, if global warming really *were* due to a (natural) decrease in volcanic activity over time (rather than due to an anthropogenic increase in greenhouse gases), then we would expect to see an increase in global surface temperatures WITHOUT any mid-tropospheric "hot spot"." "In the end, then, the confirmation of a "hot spot" in this latest study by Sherwood and Nishant isn't completely irrelevant to the issue of human-caused climate change. While it may not be a unique fingerprint of anthropogenic greenhouse gas increases, it does nonetheless potentially allow us to rule out at least one possible suspect (changes in volcanic activity). 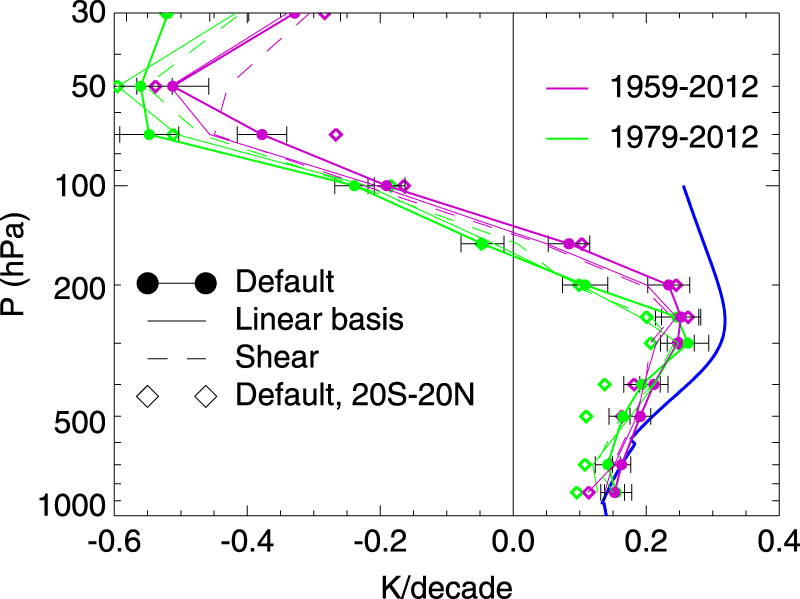 It turns out that anthropogenic changes in ozone (both tropospheric, as a surface pollutant, and stratospheric, as a result of stratospheric ozone depletion) are another potential "forcing" of climate change that does not have a clear "hot spot" signature as part of its fingerprint." If the world were cooling instead of warming, my understanding is that this too would be magnified in the tropical troposphere. That is, instead of a "hot spot" there would be a "cold spot". Right. That is also how I understand it. Although it's hot and it is in the troposphere, it's not really a "spot. No, it is not hot, it is one of the coldest places on Earth. As I wrote below the last post this makes measurements very hard. The limit of the temperature sensor. Icing which blocks ventilation. Low air pressure, which reduces ventilation. A strong sun, which may heat the sensor. When the first temperature increases in the stratosphere where found, scientists assumed it was just a measurement error. An indication how difficult measurements are up there. Interesting point you make about the early observations in the stratosphere. I didn't know that. This article gives a well-readable (I think) and interesting history of the discovery of the tropopause and stratosphere. you are correct if the surface were cooling in the tropics the tropical troposphere would cool (and at a greater rate). 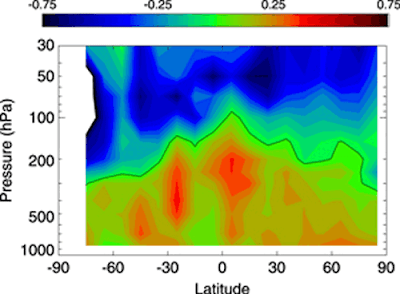 There is nothing unique about the tropospheric response to GHGs. The unique signature of anthropogenic influence is a warming troposphere and concurrently cooling stratosphere. Getting a stranglehold on on difficult stuff and getting to bed on time. Hi Sou, I've recently started reading more of your blog in full and I enjoy it very much - I'll throw in a "clarification" that I didn't see very explicitly stated here, but which I've seen incorrectly assumed in Skydragon Slayer arguments about gravity/pressure induced warming. It is that the DALR and MALR are not lapse rates in atmospheric temperature, but the rates at which the temperature of an air parcel (dry or saturated) will rise or fall as it moves down or up in an adiabatic process. And the term "environmental lapse rate" describes the atmosphere and the temperature gradient across it. Maybe you knew that or had discerned that, but again it's not often distinguished. Thanks, Alexander. I'm not sure I had discerned that properly, although what you wrote does sound very familiar to me. I'll change the text to clarify. My limited college dropout understanding of the physics involved is that the hotspot is inextricably tied to (negative) lapse rate feedback on climate sensitivity. If models overestimate the magnitude of the hotspot, they must be underestimating negative lapse rate feedback, and climate sensitivity. One might think that the cognitive dissonance of deniers arguing for higher climate sensitivity would make their heads explode, but somehow they're immune(too hardheaded?). I'm not sure about that Brian. You get negative lapse rate feedback from a hot spot, because of the latent heat transfer from the surface to the upper troposphere. But you also get an increase in water vapour and its associated greenhouse effect. This isn't directly hot spot related, but climate models show a range of lapse rate feedbacks, and the water vapour feedback compensates for changes in lapse rate feedback. The more the tropics warm, the bigger the negative lapse rate feedback. But the bigger the negative lapse rate feedback, the bigger the positive water vapour feedback. Sensitivity doesn't seem strongly affected by this. Although they all show pretty moist-adiabatic behaviour iirc, if this is not true in reality then I'm not certain what the full implications are. If for some pseudoscientific reason(the Dodge Effect*), the environmental (observed) lapse rate declined faster than the modelled lapse rate (i.e. no hotspot), the positive feedback on climate sensitivity from more water vapor in the lower troposphere (Clausius Clapeyron) wouldn't be compensated for by as much latent heat transfer to the upper troposphere where it is more easily radiated away, and climate sensitivity will be higher.The point isn't that the physics dictates that the sum of negative lapse rate feedback and positive water vapor feedback is relatively invariant over different models, but that denialists will happily argue that models are wrong in ways that must make global warming worse, contradicting themselves. I'll bet a thousand dollars to a box of donuts that Christy isn't so stupid/ignorant that he doesn't know about the negative laps rate feedback, and that the "value in determining policy " of its absence is that climate sensitivity is HIGHER than we think, and that waiting to act until we get the models perfect is a foolishly dangerous course of action. There's nothing to worry about. God will take care of things. For details, see http://www.cornwallalliance.org/2000/05/01/the-cornwall-declaration-on-environmental-stewardship/ , the Cornwall Declaration to which Christy is a signatory.